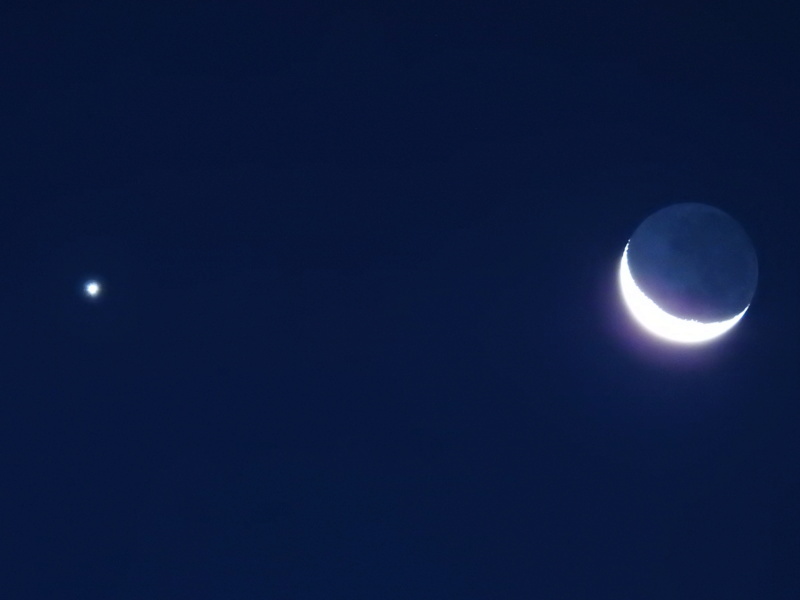 These are hand held shots tonight showing Venus n the Moon and a couple of other stars popped into view on one pic. You're probably right onto it, there is an eclipse today a couple of billion light years away. Can't recall which planet and moon but the star gazers were hoping to get vital info about the forming of the universe. I reckon it will be a while before we ever figure out what the universe actually is. We are just too small and the universe is far far larger than anyone can imagine and that is why we should focus on preserving this planet and not waste time trying to populate Mars. To actually find another Earth and to populate it will never happen because we will be extinct long before we that could ever occur. Just imagine that an amoeba got smart and built a telescope and tried to discover the size of the earth or even to discover what the earth is. That would be impossible and more-so to even imagine the solar system; and the solar system would be as far out of the equation for the amoeba as it is for us to figure out what the universe really is. The Earth is far far less to the Universe than a single Quark is to the galaxy. I checked in with two camera enthusiasts who worked for Canon and they told me the only possible way to get a 3,000mm (or a 2,000mm) zoom is to use a very small sensor. They said if you tried to focus that much glass on a larger sensor your camera body would need to be several times longer than it already is... which would make it several feet long and it would weight a ton. Hence the decision to run with a much smaller lens. Canon don't have one quite that long with their compact cameras but they too are using their smaller sensors in it as well. Canon's current superzoom compact is 50x (1200mm) and although Canon once made an EF 1200mm f/5.6L USM lens for DSLRs, it was 3 feet long or so and required a wheeled case to move it around. A second-hand copy of this lens (of which only a dozen or so remain) is still $245,000 to buy. I use an EF lens that runs up to 400mm that I add extenders to for extra zoom - but the best I can get with an APS-C sensor is about 1800mm... and the image quality, whilst still sharp, is a bit contrasty. The P900 is incredibly small and compact compared to the P1000 and if you consider than it's half the price, I'd say it's a very good buy if you like to work with a long focal length. So it sounds like the Nikon is really good (great!) value for money with that 2,000mm + zoom. Yes I do appreciate the value and capabilities of the 900, which is why I purchased it. My only gripe is that I cannot get a good planetary pic out of it and that is not much of a complaint when you consider the capability range of this cam. Looking at those clips I should be able to do a lot better than what I am at this time. Although I have used manual focus and fudged the focus but still det crap images. So back to the drawing board. 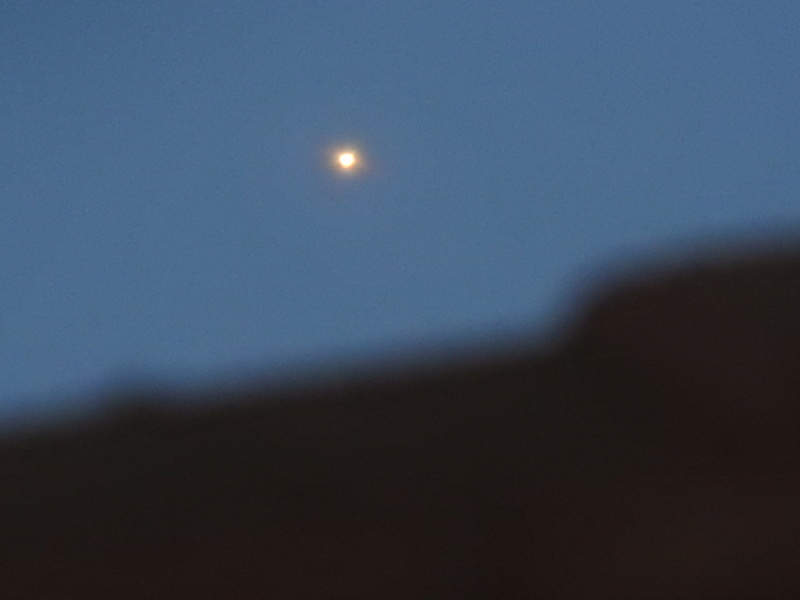 Hand held pic of Mars above the neighbours roof taken through the kitchen window this morning about half an hour ago. Still cannot get it right. Reducing the exp dosen't help much either and snapping through glass does not help a lot Even so, I spent quite a bit of time trying to get a good pic last night without success. The one degree temp was a bit off putting and I thought about going out for another try in better seeing yesterday morn but then it was minus bloody 7. So now I have ordered a big lens for my Pentax K1000D with real manual focus, not the bloody electric crap kind that never ever gets it exactly right. All of the pics of Mars that I have seen from other people on the net using the 900 look worse than this without enhancement. I will be watching and waiting for your next photo, i reckon it will be awesome! I set up my 4 inch SCT (Schmidt Cassegrain) Last night and had a look at Mars. Image was bright and pin sharp but no surface detail visible. Mars was so bright in the eyepiece that I could not see surface details or the pole caps. I have never seen Mars soooo bright before now. Surface detail has always been easily visible but last night it was like looking at Venus where the Sulfuric acid cloud cover reflects sunlight straight back at you obliterating any chance of seeing the surface. I was using 100x magnification. Tonight I will drag out the old 6 inch reflector and pump it up to 250x through a polariser and see what happens. 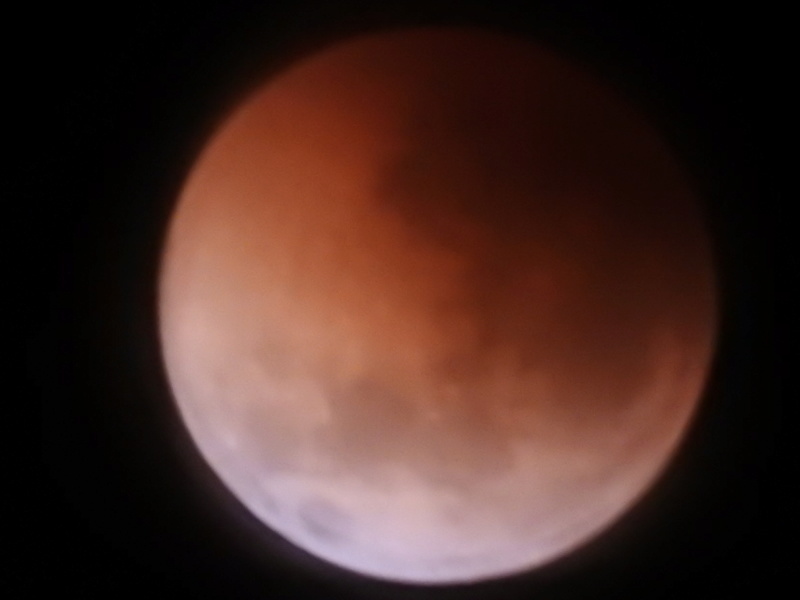 Set up the 6 inch in the back yard and could see some detail on Mars but not worth taking a pic of. 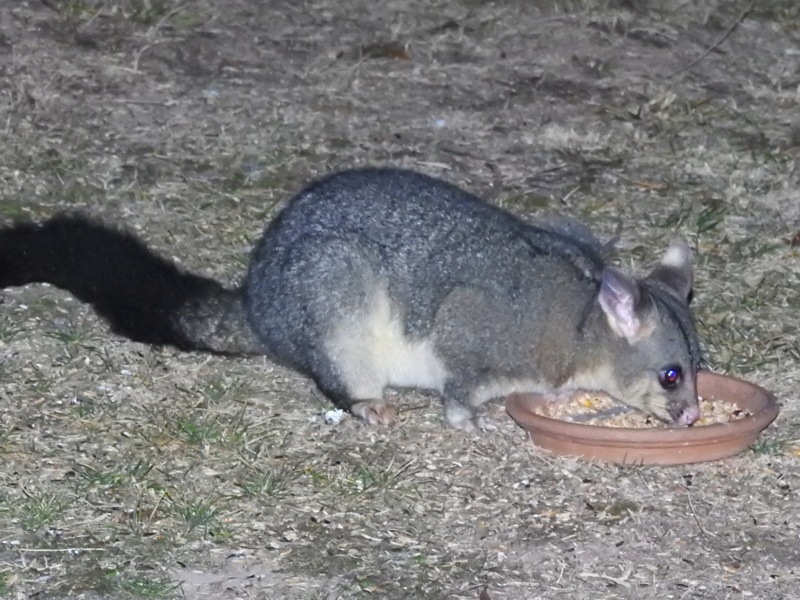 While standing in the dark and freezing night I heard a crunching and a munching somewhere in the yard. Popped the flash on the 900 and pointed the lens in the direction of the noise and snagged this little fella about 15 feet away happily cleaning out the bird feed tray. Camera was in Auto mode at 24mm, 1600 ISO. The image was cropped in the camera. 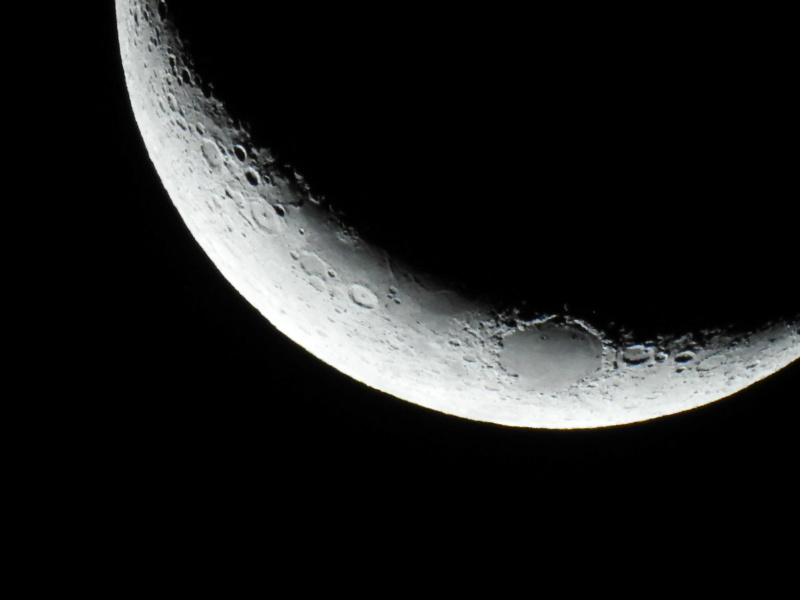 Not a bad effort for the 900 in pitch black night, moon was up but behind some cloud. I could not see this critter with naked eye. Couldn't motivate myself to go outside this morning to photo the eclipse. temp was minus 4 and sky was a bit hazy, so I snapped it through the kitchen window inc flyscreen. Not a good pic but what the hell, eclipses are a dime a dozen, there will be other opportunities. At least you got a glimpse Adrian, complete cloud cover here. Yeah Jen. Looks like daylight but it was pitch black in the back yard. The 900s flash lit him up just fine. The pic was a bit of a jag coz I could only hear him, not see him although the cam was set to 24mm which took in a lot of the yard. I don't think it matters much how much glass you put in front of the 900, the camera resolution is what it is, you could hook it up to the Hale 200 inch and it would still take crap pics of the planets. In Feb this year (I think) I obtained a used 200 mm F5 reflector scope and finally got round to taking it out of the box a month ago. It was missing a few bits and pieces. The OTA is fine but mirrors needed aligning. The mount, German G4, is ok although needs a bit of fiddling to get it right. Purchased some tube rings, and dovetail bar and fitted it to my 4 inch refractor tripod and mount and gave it a try out last night. The mount is a bit light for this scope. Image was nice and sharp and clear. An OK scope for 150 dollars even if it is not top brand. Mars looked nice and clear with some surface shading visible although the scope mirrors are still a tad out of alignment. Venus in I/2 phase was clear. Once I get the mirrors aligned properly the scope should perform even better. Nice mate. You will need to get the camera connection to take some epic photos! I bought the Canon HS60 over the 900 'coz the Canon does raw, but the Nikon doesn't. adrian ss wrote: I reckon it will be a while before we ever figure out what the universe actually is. We are just too small and the universe is far far larger than anyone can imagine and that is why we should focus on preserving this planet and not waste time trying to populate Mars. To actually find another Earth and to populate it will never happen because we will be extinct long before we that could ever occur. As long as those two billionaires keep throwing their personal millions at this greening of Mars, I can't see anything wrong with it. Yes Earth has a million sh*^y health spots and these guys all give billions to help relieve the suffering, so I think we should let them dream. Hey Slim! I didn't say you could add a "Thinks it" to the first line in the quote. But you may be correct in suggesting that the Universe might be a living thinking thing. Gold Miner wrote: Nice mate. You will need to get the camera connection to take some epic photos! adrian ss wrote: Hey Slim! I didn't say you could add a "Thinks it" to the first line in the quote. But you may be correct in suggesting that the Universe might be a living thinking thing. Sorry Adrian, my computer spell check said there was a word there wrong, so I just thought I was helping it. It's OK but not my words. Adds an interesting slant, but dun do ut again. Give yer spell checker a big smack. I fitted the 8 inch scope to the G4 mount tonight. It is more solid and I Have aligned the mirrors. 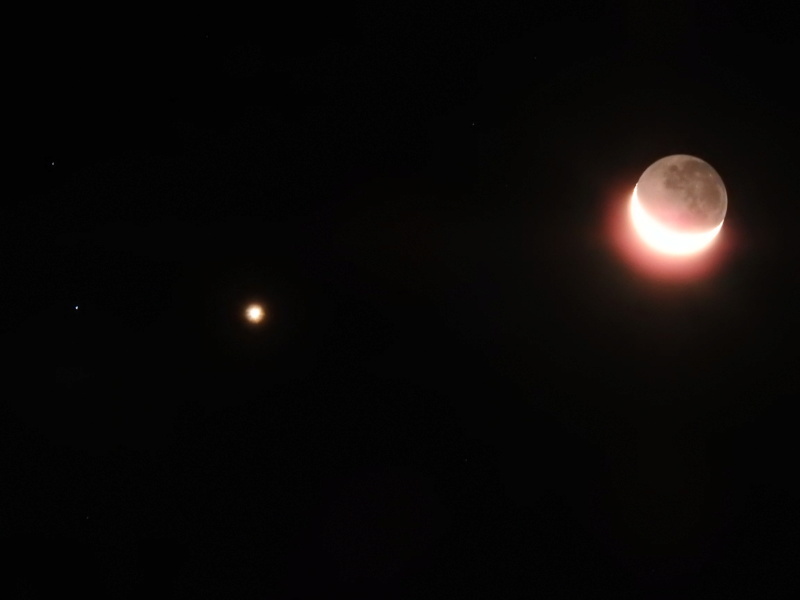 Mars n Venus were nice and sharp. 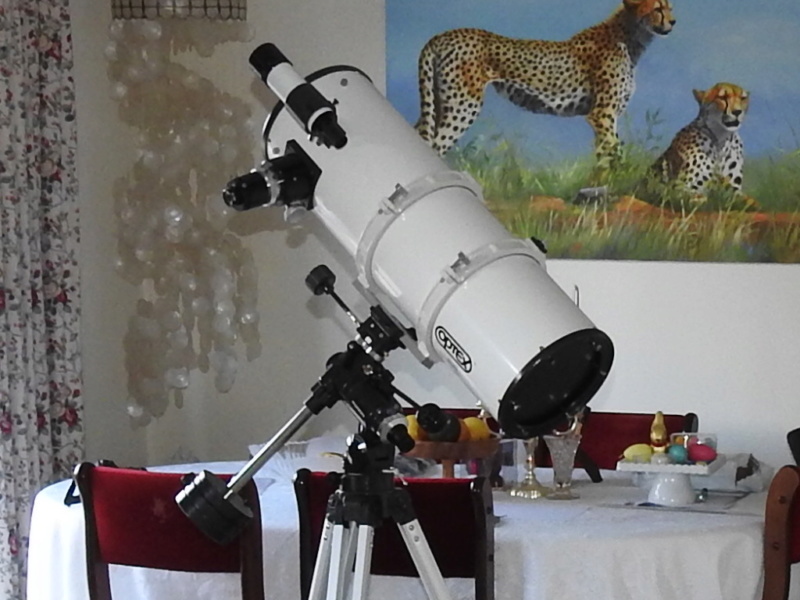 The only annoyance with this scope is that to be able to use all of my eyepieces I had to fit an eyepiece extender. Gives me the irrits when switching eyepieces. I have not had to do that with my home built 6 inch reflector. If you fit the rack & pinion at the correct position on the tube, having to fit an extender is a rareity. 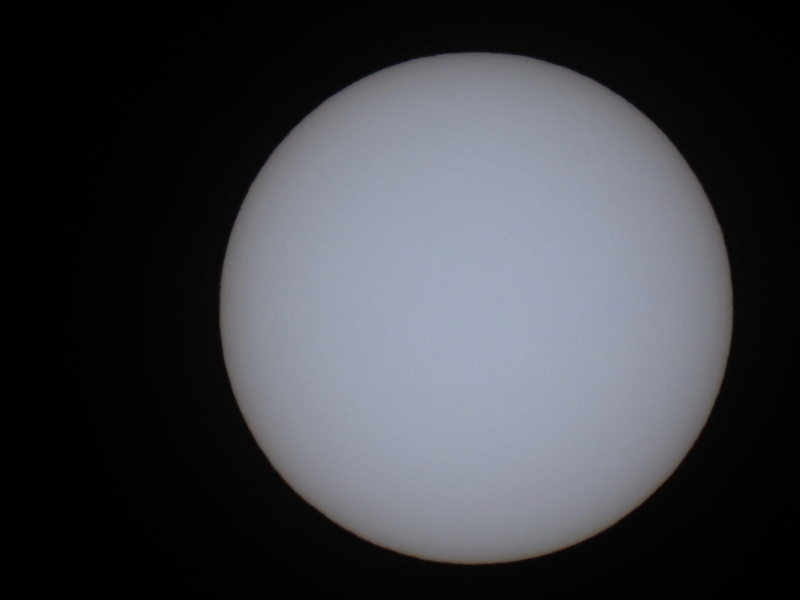 The sun is still very quiet with zero visible sun spots. Even today scientists do not know exactly what causes the 11 year sun spot cycle when the number of spots rises to maximum and decreases to minimum over a period of 11 years with such regularity. You have to wonder at what is going on inside that big bright ball of light in the sky? Yeah Jen they are messy bludgers. 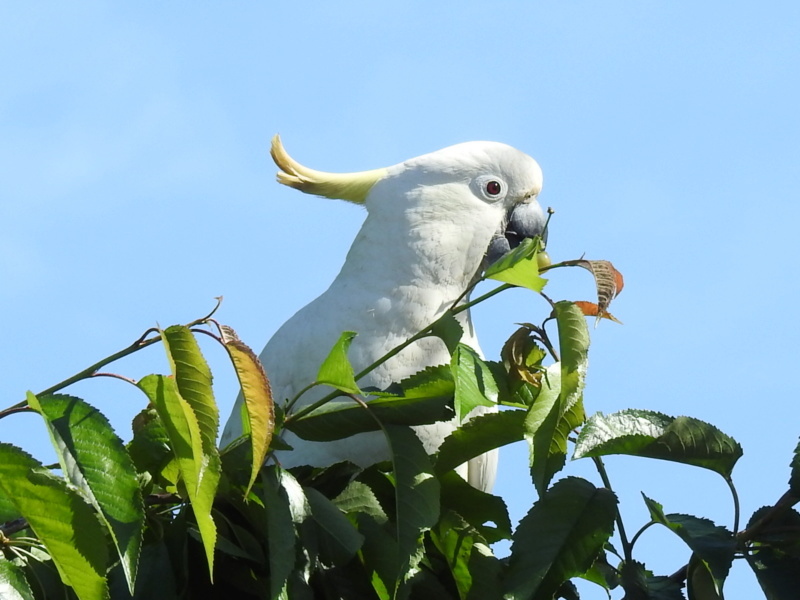 Not happy to just eat the cherries but have to bite the branches off as well. Funny you should mention pruning Jen coz that is exactly what I was thinking of doing. The tree is too tall and wide now and it will take an Ashtons Circus Big Top to cover it, so I will cut it back a lot, it will thicken up and by next year I will be able to fit a good size net over it that no critter can get through. 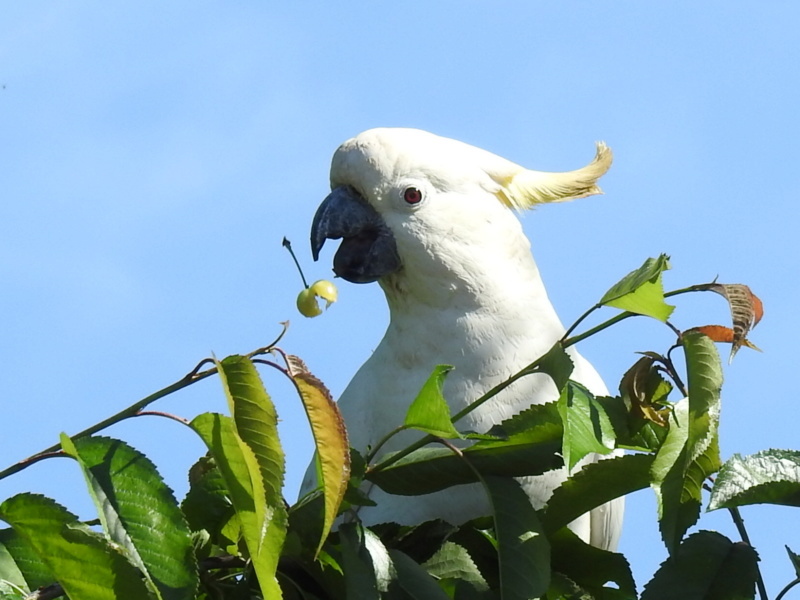 That flippin Possum a few pics back is now a regular visitor and turns out he also like cherries. I just cannot win against these little fur and feather balls. Oh well they create nice photo opportunities. After more than two years I have finally discovered that the manual focus on the P900 can be assigned to the side zoom control in manual focus mode. It is smoother and faster than the scroll wheels . adrian ss wrote: Well there ya go!! It is smoother and faster than the scroll wheels and more accurate. I did that od when I first got the P900 but still find it clumsy versus the traditional rotating lens style of focus.